Anyone who has run outside to plead with a parking enforcer knows that sometimes, a few minutes make all the difference. 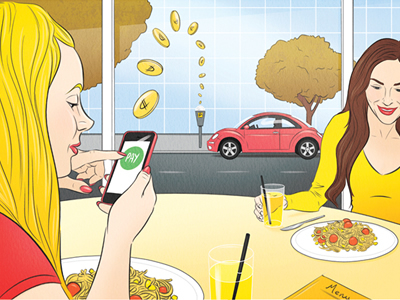 Enter ParkChicago, a mobile payment service created by Charlotte, N.C.-based PassportParking that lets users pay for parking with smartphones or cellphones. It also sends them a text message 10 minutes before their meter expires. Drivers have taken notice. Between April and June 2014, more than 70,000 Chicagoans signed up for ParkChicago, which deducts payments from users’ accounts, preloaded via credit or debit card. "Being from Chicago, I knew this was a service that would be well received," PassportParking co-founder Bob Youakim ’07 said. "It’s really a testament to the progressive nature of the community." The venture began in 2010, after Bob and his cousin, Charlie Youakim, took stock of their respective parking routines, Bob in Charlotte, and Charlie in Minneapolis. "Charlie was stuffing bills into a tiny envelope with his license plate number on the outside," Bob Youakim said. "The industry was ripe for innovation and in need of help." The cousins built a team around the goal of improving the parking experience for motorists, facility operators and enforcement officials. But some members of the parking industry were skeptical of the technology and told the Charlotte-based company their customers did not want things to change. "We still see and speak with municipalities that are hesitant in adopting cloud-based services for parking programs," Youakim said, "even though they use similar services in other aspects of their daily lives." 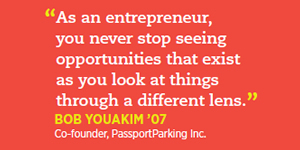 Prior to securing funding, PassportParking’s managing partners worked without salary. The support of some angel investors, family and friends kept the company going until it raised $6 million in Series A funding. "They saw that we were beating our competition on a shoestring budget," Youakim said of the investors, "and knew we could be a significant player if we put additional capital to work." PassportParking now operates in more than 70 North American municipalities, including San Jose, Calif.; Louisville, Ky.; Omaha, Neb. ; and Toronto, in addition to Chicago. "As an entrepreneur, you never stop seeing opportunities that exist as you look at things through a different lens," he said.